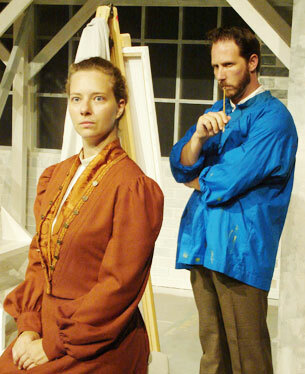 Hannah Schauer Galli and Rob Duval star in the Hawaii Reperatory Theatre's production of "Inventing Van Gogh." No prior exposure to the life and art of Vincent Van Gogh is necessary to be pulled into the action as Hawaii Repertory Theatre opens its season with a challenging and beautifully produced production of Steven Dietz's surrealistic mystery, "Inventing Van Gogh." Where: Kawananakoa Backstage Theatre, Kawananakoa Middle School. Those who know Van Gogh only as "the guy who cut his ear off," or as the subject of a 1972 pop hit, "Vincent," will find Dietz's play a perfect blend of fact, fiction and drama. Others with more background in art can compare Dietz's take on Van Gogh, Gauguin and other historical characters with their own. The premise is simple yet surprisingly complicated. Rene Bouchard, a respected art expert, decides to run a world-class scam by "discovering" and then authenticating a previously unknown Van Gogh self-portrait - the very last before he committed suicide. Since the portrait does not exist, he strong-arms conflicted young artist Patrick Stone into painting it. Bouchard didn't pick Stone at random. Stone was a student and longtime friend of Dr. Jonas Miller, an American professor who was obsessed with Van Gogh and was convinced that the artist had in fact painted a final portrait in the last week of his life. Miller's obsession caused him finally to commit suicide in almost the exact same place in France that Van Gogh shot himself in 1890. Bouchard hints darkly that he could get the authorities to reopen the case as a homicide investigation with Stone as the suspect. And, if that's not enough pressure, Stone also has a history with Miller's abrasive, off-putting daughter, Hallie. Bouchard is using her to pressure Stone as well. The story begins when Van Gogh appears in Stone's studio and begins talking with him about art. It isn't long after that that Gauguin drops in to give Stone his opinion of Van Gogh, his work and their friendship. The story shifts seamlessly between past and present as two interconnected stories play out. There's Stone trying to make sense of his life, his career and his relationship with Hallie as he forges a Van Gogh amid discussions with the artist. And there's Van Gogh careening through the last months of his life in France. Both stories are riveting, start to finish. Director Paul T. Mitri provides a strong foundation with his performance as Stone. Rob Duval is brilliant in playing Van Gogh as a fragile, mentally unstable genius we'd all nonetheless be honored to count as a friend. The other cast members play multiple characters in each time period. Russell Motter, always good as a villain, is convincing and entertaining as the malevolent, manipulative art expert. His portrayal of Gauguin is appropriately more opaque: Did Gauguin treat Van Gogh badly, or did he simply have a low tolerance for Van Gogh's strange behavior? Ned Van Zandt (Jonas Miller) is convincing as a man obsessed. Miller provides much of the academic backstory, including a well-reasoned argument for the existence of a final Van Gogh self-portrait. Van Zandt also is a success as Van Gogh's doctor. Hannah Schauer Galli completes the cast in the dual roles of Marguerite Gachet, one of Van Gogh's love interests, and Hallie Miller. Marguerite was apparently in a dysfunctional relationship with Van Gogh. Hallie, meanwhile, is so abrasive that it is never clear what attracted Patrick to her in the first place. Brian Lee Sackett's solid-looking warehouse set and David Griffith's lighting give the talented cast an attractive performance space and allow the audience to see some of Van Gogh's (real) artwork as well.